It’s somehow August already, which means summer is winding down and the school year is looming closer and closer. Gone are the leisurely mornings and calm afternoons; instead, days will be filled with blaring alarm clocks, last-minute lunches and dashes for the bus. Do early morning practice runs: Instead of waiting for the first day to enforce bedtimes and early alarms, start getting your family on the school schedule a week or two before the big day. Get your kids used to going to bed earlier, get them up at the same time they’d have to get up for school and get everyone on the morning routine. By getting the whole family used to the schedule, you’ll save yourself from a lot of bleary-eyed mornings. Create a command center: It doesn’t have to be elaborate or especially pretty, but a command center by the front door can be essential to your family getting out the door with everything they need. Keep a calendar by the door with everyone’s schedule, keep a file organizer for permission slips and forms and use a dry erase board to write down important reminders like “Remember your clarinet for band practice!” Get some great ideas on the Heart of Florida United Way Pinterest page. Make a (slim) shopping list: It is a truth universally acknowledged that children double in size over the summer and new school clothes can wreak havoc on your budget. Have your child try on the clothes they have so you can see firsthand what needs replacing before you head to the mall. From there, you can make a list of what’s really needed. If you prepare in advance, you can even scour thrift shops and consignment shops to get the best deals. Shop strategically: School supplies can be overwhelming and expensive. 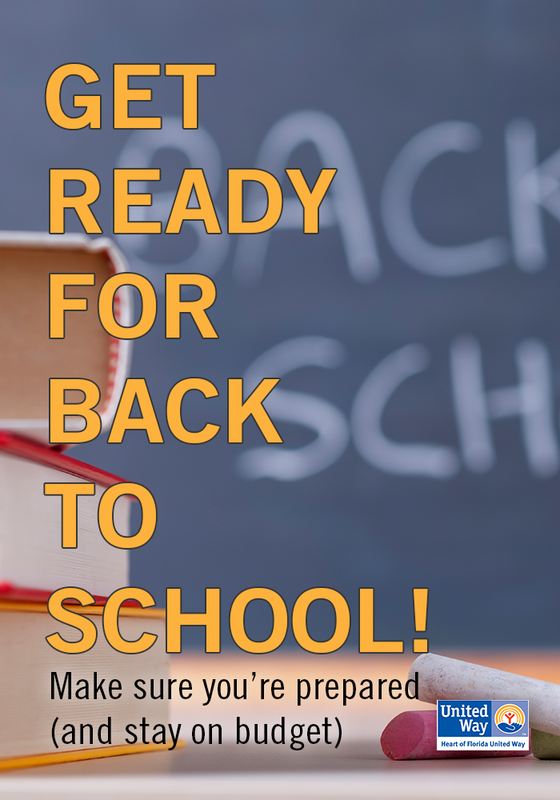 Make sure you have your child’s back to school list before you start and compare sales. The earlier you shop, the better chances you’ll score a good deal. If you can’t afford new school supplies, there are community resources available. Local organizations may be able to help you get the supplies you need; call 2-1-1 if you need help to get connected. Partner up: Many of the school supplies on your child’s list can be purchased cheaply in bulk. Partner with another student’s parents and see if you can split the costs of construction paper, notebooks and more. Gather necessary paperwork: Some schools require extensive paperwork, from physical exams to proof of vaccinations. Check with your child’s school to see exactly what you need so you’re not scrambling Monday morning. Ruthlessly Simplify: What makes mornings the hardest? Do you have one child who just can’t get out of bed? Is breakfast slowing everything down? Evaluate the pain points and try to simplify the process. Lay out breakfast dishes and supplies the night before. Pick out clothes and iron them and hang them on each child’s door before they go to bed. Come up with a bathroom schedule to keep everyone on track. And perhaps a fun alarm clock placed on the other side of the room can help coax a sleepy child out of bed. Create a homework station: Make homework-time easier by creating a homework station where your child does his work—either at his own desk or on the kitchen table. Use a small drawer or serving tray to corral everything your child needs: pens, pencils, paper, erasers, calculator, scissors, labels and highlighters. Having it all in one place will keep your child from getting distracted while searching for supplies. Set a homework time: Schedule a set time each day for your child to complete her work when you’ll be available to help. Keeping it to a set time will ensure it gets done and leave plenty of time for relaxation. Do a test drive: The first day of school is not the time to find out that your usual path has construction or that traffic adds 15 minutes to the regular route. Do a practice run to figure out how much time your child needs to get to school and add 5-10 minutes on as a buffer just in case. Heart of Florida United Way believes education, both in and out of the classroom, is a lifelong experience and the most influential factor in ensuring a child will grow up to succeed. To help ensure children get the education they deserve, we fund many programs in the area that provide essentials for children, such as mentoring and tutoring services, literacy initiatives, food pantries, medical services and clothing. To get help, please call the 2-1-1 Information and Assistance line. For more information about how Heart of Florida United Way invests in education, visit our website.